In the modern world, where just about every product seems to be on a price hike, a mountain bike is often considered a luxury item. But the truth is, it’s possible to own a quality mountain bike for $300 or less. 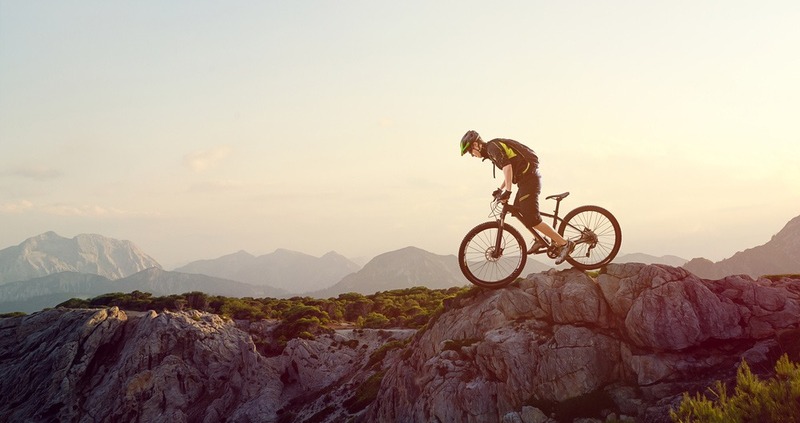 Considering the rise in competition, a majority of companies are now infusing the latest technologies in mountain bikes but at affordable rates. And the good news is, the added features in these mountain bikes are not for show. Even though the parts are cheap, they provide equal performance and comfort as those present in high-end models. We carried out an intensive research to determine the best mountain bikes under $300. 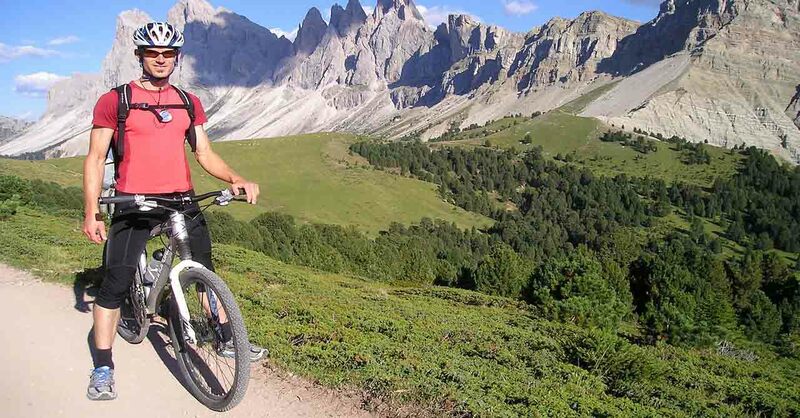 Mountain bike type : Perhaps the most important factor to consider is the type of mountain bike to buy.There are different kinds on the market such as cross-country bike, hardtail bike, full suspension and so on. You have to opt for a type that meets your needs. Frame material : The frame material used to manufacture the mountain bike you want to use is equally important. In considering the frame look for such factors like weight, durability, and strength. It should be strong enough and it should be durable. Consider such materials like steel, carbon fiber, aluminum, and so on. Features : The third important factor to consider include the mountain bike features. There are different aspects of such bike you should always consider when you are making your choice.Consider the whether it tubeless, brake type, suspension and so on. 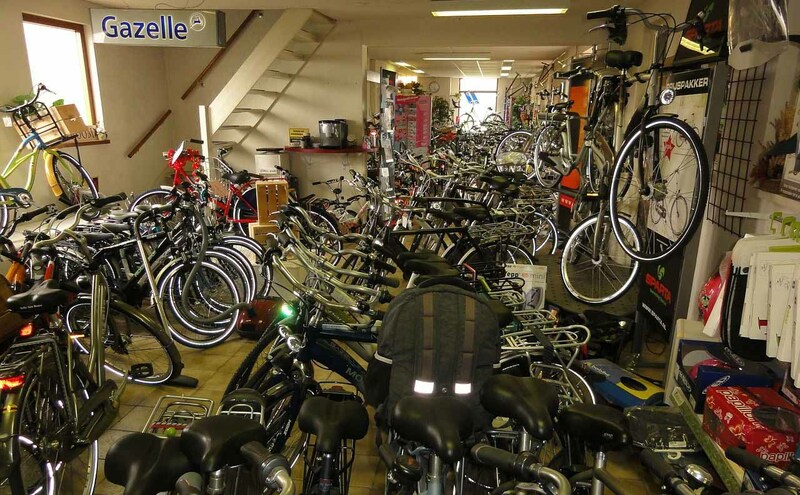 Bike sizing : Furthermore, you have to consider the bike sizing when you are making your choice. Consider your height and compare it with the frame size. Wheel size is equally important when you are deciding your choice. Price : This is another important feature you should consider when you are making your choice. In deciding the price, you should not compromise quality. 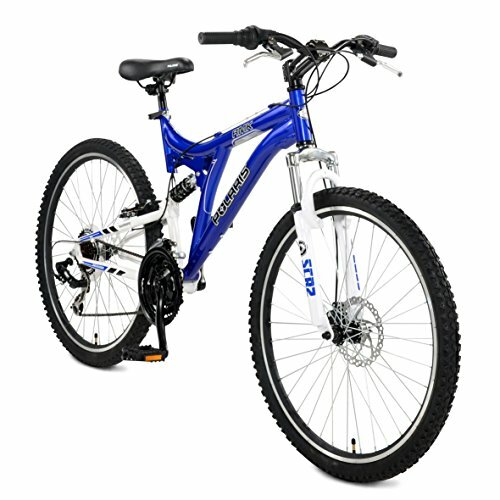 One of the key highlights of this mountain bike is its aluminum frame, which is known for being steady and tough. This frame has been uniquely designed to guarantee optimal comfort and biking performance. Even though it’s slightly heavier than beginner mountain bikes, you’re sure of getting adequate control and a responsive ride regardless of the weather condition. And thanks to the dual full suspension system, the Mongoose R2780 has all the suspension aspects covered. The bike comes with a shock suspension feature, making it easier to go over bumps. Also, since the rear element shocks do not have any hydraulic dampening, they are able to tackle off-road runs comfortably. The dual full suspension increases the rider’s comfort. The large 29-inch wheels provide stability. Comes with mechanical disc brakes on the front and rear to provide safety. Reduced speed with the 21-speed gear shifter. 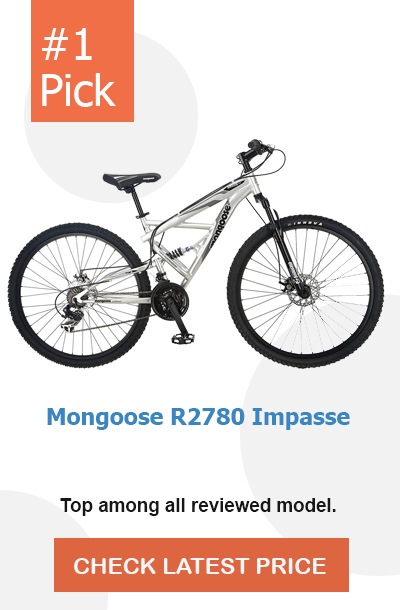 Summary :- For a typical mountain bike within this price point, the Mongoose Impasse confers plenty of benefits. Thanks to the aluminum frame, the bike is light and hence easy to navigate. But considering the big size of the frame, the bike is best suited for individuals who are 68 inches or taller. Finding the perfect hardtail mountain bike as an entry-level rider can be challenging. 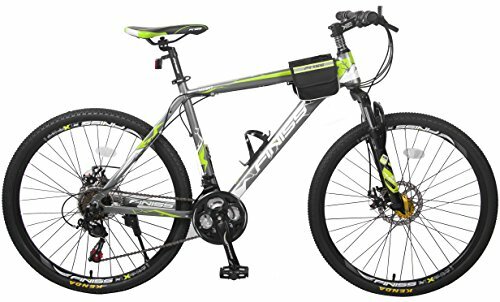 The Merax Finiss 26-inch mountain bike is designed to make this task simpler. This bike performs incredibly well without spending too much of your money. The frame on the Merax Finiss consists of heat-treated aluminum, making the bike to be more on the lighter side of the spectrum.Thanks to this lightweight design, the bike is easy to carry along on road trips and hiking expeditions. Other than making the bike light, the aluminum frame offers better resistance against fractures than alloys do. This increases the overall durability of the mountain bike.This bike also boasts an 80mm suspension fork, an aspect that gives the rider more control of the bike. Merax Finiss 26-inch is one of the most recommended for trail riding, as it can tackle all sorts of terrain; from grit to mud and sludge. Has an appealing design that mimics that of a high-end mountain bike. The 80mm travel suspension fork helps in absorbing shock on bumpy terrains. Lightweight construction that makes it beginner-friendly. It arrives when it’s 85% assembled. Comes with a comfy saddle. Not suitable for jumping or navigating over rough roads. 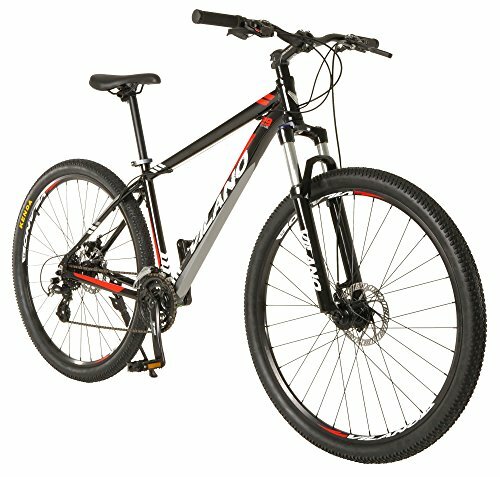 Summary :- Light, comfortable and beautiful are best terms to describe Merax Finiss 26-inch mountain bike. It has outstanding features and offers an incredible performance, which is why it ranks second in the top-rated mountain bikes under $300. 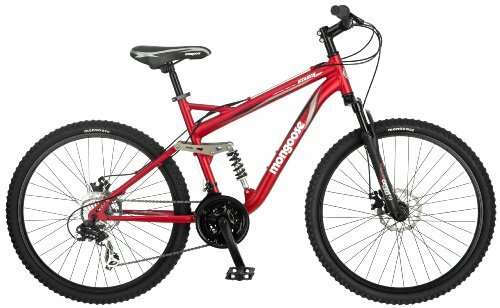 If you’re looking to buy your teenage son or daughter a mountain bike, this 24-inch model by Northwoods is the perfect option. Going for less than $200, the Northwoods is also ranked as one of the best full suspension mountain bikes. So what makes this bike so exceptional? First off, the entire frame on this mountain bike is made of aluminum, which makes the bike light but also sturdy in all the right places. In fact, the bike weighs a measly 42 lbs. Apart from being light, the bike is available in a range of exotic colors to suit different consumer tastes. These include grey/ orange and grey/green. Another plus of this bike is its full suspension system, meaning that both its front and rear have a suspension system albeit slightly different. On the front section, the suspension is provided through a 50mm travel steel crown fork. The suspension system on the rear mainly serves as a shock absorber. Although heavy, the steel fork provides advanced protection against wear, especially when the bike is ridden in harsh environment. As stated earlier, the Northwoods mountain bike constitutes 24-inch wheels, which is the perfect size for kids. These wheels are wide enough to offer ample traction and stability. Plus, the wheel rim consists of alloy, which minimizes the wear and tear that could arise from the linear pull brake. Large knobby tires to provide stability. Easily customizable to rider's need. Smoother ride due to the full suspension system. No warranty is provided on assembly-related malfunctions. Might take a while to familiarize yourself with the braking system. Summary :- The Northwoods Full Suspension mountain bike will fit perfectly into your $200 budget. And the good thing is that, it has all the right features that make it a great fit for beginners and advanced riders. The Stowabike MTB V2 is the perfect mountain bike for your casual weekend escapades. It boasts an exceptional folding mechanism that makes it fit inside trunks and other small-sized storage spaces. There’s a lot to love about this 26-inch wheeler. For starters, it’s integrated with dual suspension system to provide optimal performance. This suspension system provides the much-needed traction and helps reduce the likelihood of toppling over.Also, this mountain bike comes with an instructional manual, which makes its assembly easy. Thanks to this comprehensive guide, even first-time riders won’t have a difficult time assembling its parts. Some of the tasks you’ll have to do include attaching the bike pedals to their arms, connecting the front wheel, the handlebars post as well as the seat. When it comes to speed options, this bike is characterized by 18 speeds with a 3-speed grip shifter on the left and a 6-speed grip shifter on the right. These shifters are strategically located to make shifting gears that much easier. Fitted with a zoom steel suspension fork for a comfortable ride on rough terrains. Folding bike that saves on storage space. The bike comes with tools you'll need for assembly. Has a robust and nice-looking frame. The frame is made of steel, making the bike heavy and thus, difficult to maneuver. The seat is a bit tall. Summary :- For many homeowners, storage space is always an issue. If you love mountain biking but are short on storage space for your bike, the Stowabike 26-inch model is designed for you. It has a folding frame, meaning that it takes up very little space. If you live in a hilly terrain, the Mongoose Stasis will make your commutes to and from work, easy and exciting. And the best part is that you don’t have to part with too much money to purchase a quality mountain bike like the Mongoose Stasis. Designed for riders who are 5’3” tall, this mountain bike boasts a solid build. It has an aluminum frame coupled with alloy rims. While these two features will have you thinking that the bike is heavy, the Mongoose Stasis is actually one of the lightest models. Moreover, the bike is equipped with mechanical disc brakes that work effectively, helping you to stop swiftly when you need to. With this bike, you will be able to ride off track with ease. However, the bike is not recommended for riding downhill. Another highlight of this bike is the quick release mechanism on the front alloy wheels, which add to its safety. With this bike, the chance of falling off or toppling over obstacles are very rare. Perhaps the only drawback of this mountain bike is its seat, which feels a bit rough and uncomfortable. Nonetheless, you will still be able to ride for 30 to 40 miles without getting fatigued. The bike is durable because of the superior quality components. It is lightweight and this is good for riders as they can use it in difficult terrains. Assembling the disc brakes can be challenging. 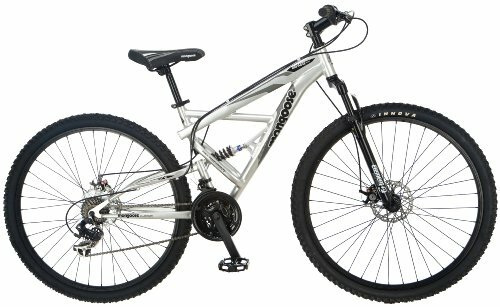 Summary :- Mongoose Stasis mountain bike is one of the best not just in terms of performance but also in durability. Its gearshift is one of a kind and the disc brakes on the rear and front wheels provide adequate braking power. Are you looking for a budget-friendly mountain bike that can outperform many higher-priced competitors? Then look no further than the Vilano Blackjack 29-inch wheeler. The first thing you’ll notice about this mountain bike is its handcrafted aluminum frame, which makes the bike pretty light. 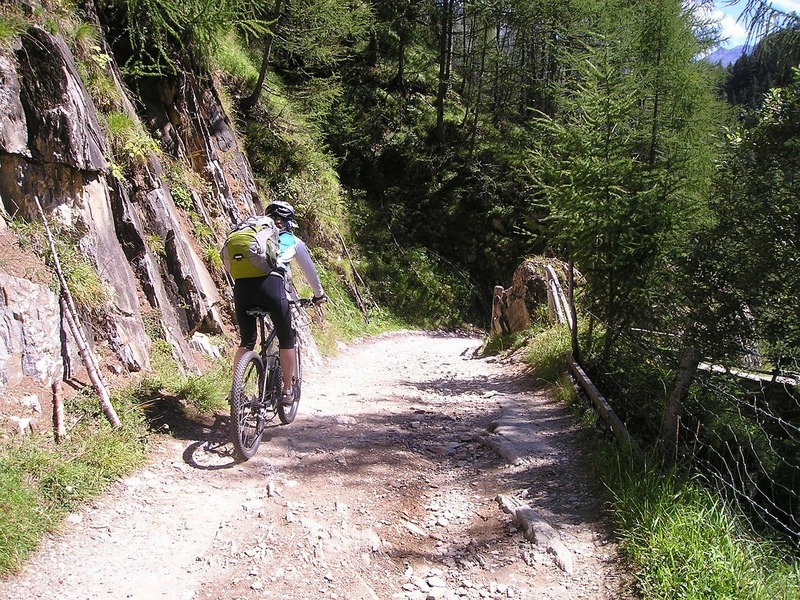 This means that you won’t struggle navigating the mountain bike over rough and steep terrains. Moreover, the frame of this bike is designed to tackle hilly terrains with ease. You will also love the 80mm suspension fork system, which absorbs shock efficiently. This way, you can ride over rocks and bumps without experiencing any discomfort. Another plus of the Blackjack MTB is the premium quality of the drive train and brakes. The bike boasts a 21-speed drive train that includes the Shimano EZ shifters. These shifters are known to work efficiently, allowing riders to change gears accurately and swiftly. Also, the 21-speed drive train allows you to ride at any speed and in any weather condition. Vilano Blackjack comes with 29-inch wheels, which are capable of tackling any terrain. And thanks to the double alloy rims, you are guaranteed of having a smooth and stable ride. The bike is sturdily built and that is why it would serve you for a very long time. Moreover, it is lightweight, because of the aluminum materials that are used in making it. There have been complaints about loose screws and bolts. Brakes might need a replacement. Summary :- If you’re looking for a powerful mountain bike that can handle any terrain, the Vilano Blackjack is your best bet. It has large 29-inch wheels, which are not only able to tackle rugged landscapes but they also provide maximum stability. Are you a mid-range rider looking to spend your holiday with a bit of excitement? If you are, you should try out biking with the Schwinn Men’s High Timber bicycle. Not only will this be a fun activity but it will also confer an array of health benefits. One of the greatest perks of this bike is its unique wheel size. The large 29-inch wheels are loved for having superb traction and enhanced momentum. Another handy feature is the fact that its frame stands at 18 inches from the ground. 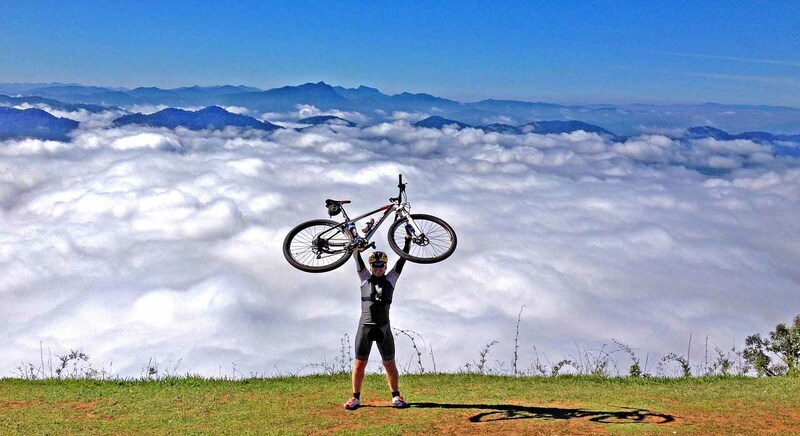 At this height, it is neither too high nor too low, which makes it ideal for most bikers. Also, the frame is much thicker; thus, stronger than other materials. Another thing you’ll love about this bike is the saddle. It has a double-sided design, providing a larger surface area to fit riders of all sizes. Plus, this saddle has a high-quality padding, making it comfortable to sit on for prolonged periods. Designed to take on any terrain. Perfect fit for entry-level riders. Shimano shifters make for smooth gear shifting. 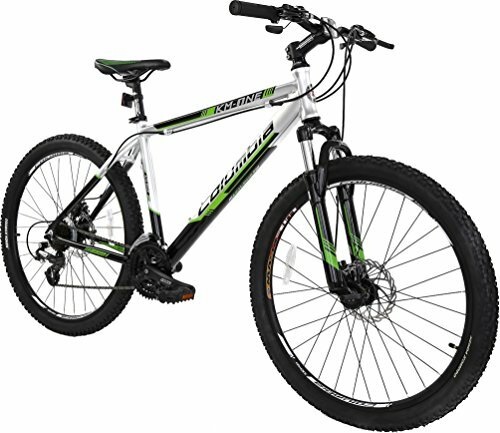 Summary :- Schwinn High Timber is a great-looking mountain bike for the adventure-loving people. It’s equipped with a set of features that will give you a thrilling riding experience. The Merax Flacon is the best mountain bike to get if you’re looking to incorporate some customized features into your new mountain bike. 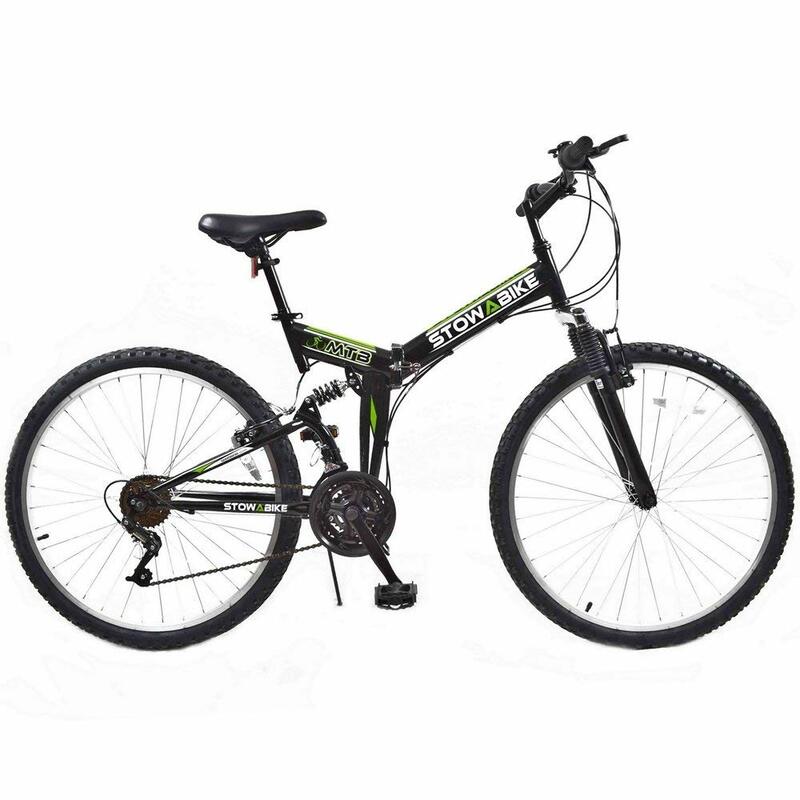 Overall, it’s an excellent choice for riders who want a reliable mountain bike. Since it’s a full suspension bike, the Merax Falcon handles rugged terrains pretty well. It’s only available as a 26-inch wheeler so if you’re shorter than 5 ½ to 6 feet, this might not be the best fit for you. Also, it has a maximum weight limit of 330 lbs. Another good thing about this mountain bike is that its assembly is easy. In fact, its front wheel is detachable making it so much easier to store in your trunk. The mountain bike comes with 21 speeds, giving you a range of options to work with. Does not require much assembly. Has adjustable saddle height and handlebars. Suitable for transportation and exercise. The alloy wheels with steel hubs increase durability. Summary :- Merax Flacon is a good deal, particularly for riders who want a cheap mountain bike, which they can later add some pricey modifications. With an aluminum frame, full suspension and 21 speeds with a derailleur, it will give you the biking experience you’re looking for. 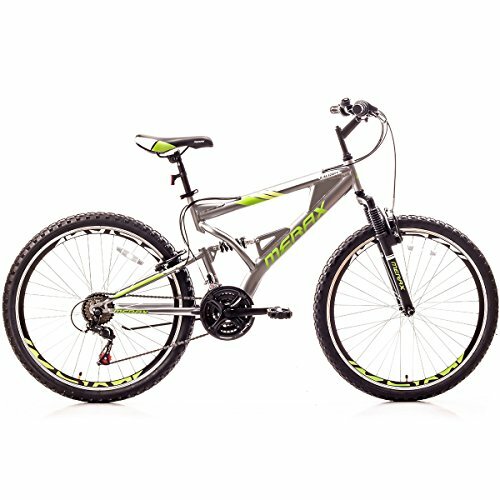 If you are just getting started on mountain biking sport, this bike will serve you well. After riding the Columbia KM, you’ll be in a position to determine whether this sport suits you or not. One thing you’ll notice about this mountain bike is that it has a low price tag. However, this does not mean that it compromises on its parts. On the contrary, it offers all the bells and whistles that mountain bikes come with. For one, its frame is constructed using AL6061 aluminum, which makes it very light; hence, easy for new riders to handle. Also, the bike comes with derailleurs and shifters as well as robust double-wall rims, making the bike well-rounded for any terrain. Often, you will find that most mountain bikes have 21 speeds. However, the Columbia KM has 24 speeds, giving you a variety of options to tackle different terrains. Large sized 26-inch wheels that provide stability. It has front and rear disc brakes. Possible to make height adjustments. Suitable for casual trail riding. Summary :- The Columbia KM mountain bike is a great option for entry-level riders. 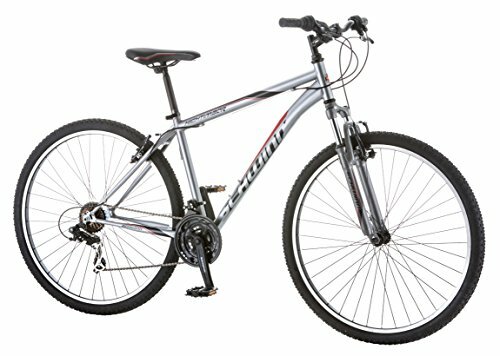 The 24-speed and aluminum frame features make it suitable for novice bikers. Are you looking for a superior quality bike? This is one of the best you can lay your hands on the market today. It has the most fantastic features. It is composed of 18.5 in frame with Force Suspension Fork. This makes it great and durable.It uses the best suspension fork and because of that, it can travel in different terrains without difficulties. Furthermore, it features Aluminum Rims with WD 26 x 1.95 Tires and because of that, it performs better and this makes it more durable.The braking system is equally efficient and reliable. You would be in control when you ride it because of the strong braking system. The bike is strong and durable. The braking system is efficient. It is stable and can ride difficult terrains without difficulties. Summary :- In all, this is a great product and it cannot disappoint you. It is strongly recommended. With the myriad of mountain bike options on the market, it’s not surprising that new riders and seasoned pros alike, become overwhelmed and confused about which bike to buy. This is where we come in. We spent more than 40 hours researching and comparing online reviews to identify the best mountain bikes. After narrowing down our options to about 20 models, we took each one of them for a rigorous and thorough test ride. We also raced these bikes against one another and evaluated their performance on different terrains. One of the test trails that we rode on was a fast and flowy mountain that had a ton of sandy corners and berms. These test rides helped us to understand the core strengths and weaknesses of each mountain bike. After this testing process, we choose these 10 models as the best mountain bikes worth investing in. "Use this code to add this Infographic to your website"
When you use any of the recommended products, you are going to derive value for your money. They have the best features. You see that they are designed with the best materials available in that industry. Moreover, most of them are designed in such a way that you are not going to find it difficult to use it. The braking system is efficient and this makes them reliable. The assurance is that for any of them you decide to buy, you would derive value for your money. These are the best you can lay your hands on that budget. They are all recommended. 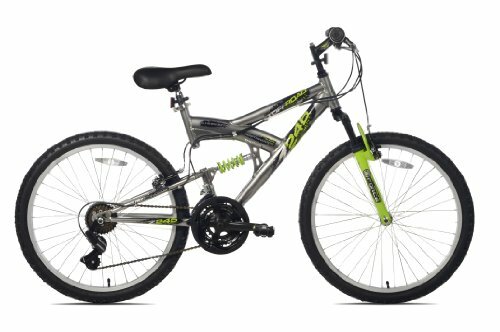 Nice bike at a great price.